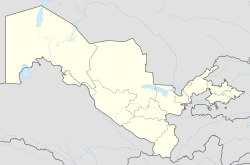 Nukus (Uzbek: Nukus, Нукус; Karakalpak: Nókis, Нөкис; Kazakh: Núkis; Russian: Нукус) is the sixth-largest city in Uzbekistan, and the capital of the autonomous Karakalpakstan Republic. The population of Nukus as of January 1, 2018 was approximately 312,100. The Amu Darya river passes west of the town. The name Nukus comes from the old tribal name of the Uzbeks, Nukus. 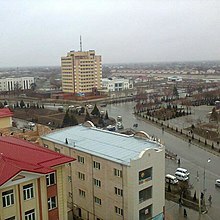 Nukus developed from a small settlement in 1932 into a large, modern Soviet city with broad avenues and big public buildings by the 1950s. The city's isolation made it host to the Red Army's Chemical Research Institute, a major research and testing center for chemical weapons. In 2002 the United States Department of Defense dismantled the Chemical Research Institute, the major research and testing site for the Novichok agent, under a $6 million Cooperative Threat Reduction program. Nukus is host to the Nukus Museum of Art (also known as the State Art Museum of the Republic of Karakalpakstan, named after Igor V. Savitsky) and State Museum. The State Museum houses the usual collection of artifacts recovered from archaeological investigations, traditional jewelry, costumes and musical instruments, displays of the area's now vanished or endangered flora and fauna, and on the Aral Sea issue. The Art Museum is noted for its collection of modern Russian and Uzbek art from 1918-1935. Stalin tried his best to eliminate all non Soviet art from this period, and sent most of the artists to the gulag. Both Savitsky himself and the collection at Nukus survived because the city's remoteness limited the influence and reach of Soviet authorities. The documentary film The Desert of Forbidden Art is all about the collection and its history. Nukus is also home to the Progress Center, a private English-language progressive school. Housed in a former Komsomol meeting hall, the institute has received major funding from UNICEF. Nukus experiences a cold desert climate (Köppen BWk) with summers that are long, dry and very hot, and winters that are short, though quite cold and snowy, having a very dry type of a continental climate. ^ Miller, Judith (25 May 1999). "U.S. and Uzbeks Agree on Chemical Arms Plant Cleanup". New York Times. Retrieved 13 March 2018. ^ Tom Bissell, Chasing the Sea, Pantheon (2003). ISBN 0-375-42130-0. p. 323–324. ^ Bissell, Chasing the Sea, p. 325–326. ^ Stephen Kinzer, "Nukus Journal; In Plain English, These Uzbeks Are Going Places", New York Times October 24, 1997. Wikimedia Commons has media related to Nukus.